The Premier League Golden Glove is an annual association football award presented to the goalkeeper who has kept the most clean sheets (when a goalkeeper concedes no goals during a single match) in the Premier League. For sponsorship purposes, it has been referred to as the Barclays Golden Glove since its inception during the 2004–05 season until the 2015–16 season. Since 2017–18 season, it is known as the Cadbury Golden Glove. Originally, the Golden Glove could only be won outright by a single player; should there have been a tie, the goalkeeper with the superior clean sheets-to-games ratio received the award. However, starting in the 2013–14 season, the Golden Glove is shared by goalkeepers with an equal number of clean sheets, regardless of the number of games they played. The Premier League was founded in 1992, when the clubs of the First Division left the Football League and established a new commercially independent league that negotiated its own broadcast and sponsorship agreements. In 2005, the Premier League Golden Glove was first awarded, with Petr Čech its inaugural recipient. Čech and Joe Hart have won the award on four occasions, the most out of all goalkeepers. Hart played for Manchester City in each of his four winning seasons and they are the club that has received the award the most. Čech and Hart's four awards mean Czech and English goalkeepers have won the Golden Glove the most, ahead of Spain with three. Both Pepe Reina and Hart have won the award in three consecutive seasons, which is a record. Čech set the record for matches without conceding a goal in a single season – with 24 – to win the inaugural award in 2005. During the 2008–09 season, Edwin van der Sar surpassed Čech's previous record of 10 consecutive clean sheets by reaching 14. During his streak, Van der Sar went 1,311 minutes without conceding a goal. In the process, he broke Čech's Premier League record (1,025 minutes), Steve Death's Football League record (1,103 minutes) and the all-time league record in Britain (1,155 minutes) for most consecutive scoreless minutes. Manchester United keeper David de Gea is the winner for the 2017–18 season. ^ a b c "Chelsea scoop hat-trick of Barclays awards". Premier League. 13 May 2010. Archived from the original on 16 May 2010. Retrieved 2 February 2014. ^ Wright, Nick (18 May 2015). "Who will win the Golden Glove? Hart, Fabianski, Mignolet, Forster and Courtois in contention". Sky Sports. Retrieved 27 May 2015. ^ "History of the Premier League". Premier League. 1 July 2015. Retrieved 11 July 2015. ^ a b Bird, Liviu (12 August 2013). "Premier League Preview: Top 5 goalkeepers to watch". NBC Sports. NBC Sports Group. Archived from the original on 18 February 2014. Retrieved 1 February 2014. 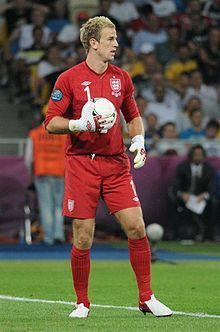 ^ "Hart grabs Golden Glove award". MCFC.co.uk. Manchester City F.C. 24 May 2015. Archived from the original on 26 May 2015. Retrieved 24 May 2015. ^ a b Booth, Mark (8 May 2013). "Three in a row for Golden Hart". MCFC.com. Manchester City FC. Retrieved 1 February 2014. ^ a b "Petr Cech Statistics – 2004/05". premierleague.com. Retrieved 17 December 2017. ^ "Van der Sar concedes following 14 clean sheets". FourFourTwo. Haymarket Media Group. 4 March 2009. Retrieved 1 February 2014. ^ a b c Mariner, James (1 June 2011). "Edwin van der Sar: A career in pictures". The Independent. Retrieved 1 February 2014. ^ "Man Utd record delights Ferguson". BBC Sport. BBC. 27 January 2009. Retrieved 1 February 2014. ^ "Where Are They Now? Reading 1978–79". The Football League Paper. London. 6 November 2013. Retrieved 10 July 2015. ^ Mole, Giles (18 February 2009). "Manchester United's Edwin van der Sar still lags behind European clean sheet record". The Daily Telegraph. Retrieved 2 February 2014. ^ Eaton, Paul (8 August 2007). "Reina nets goalkeeping award". Liverpool F.C. Archived from the original on 6 October 2014. Retrieved 26 May 2015. ^ "Reina collects Barclays Golden Glove Award". Premier League. 15 May 2008. Archived from the original on 18 September 2008. Retrieved 2 February 2014. ^ "Pepe Reina picks up Barclays Premier League golden gloves prize". Liverpool Echo. 15 May 2008. Retrieved 2 February 2014. ^ "English Premier League 2008–2009: Table". Statto. Archived from the original on 11 July 2015. Retrieved 11 July 2015. ^ "Hart handed Barclays Golden Glove". Premier League. 20 May 2011. Archived from the original on 22 May 2011. Retrieved 2 February 2014. ^ Clayton, David (8 May 2013). "Hart wins Golden Glove award". MCFC.com. Manchester City FC. Retrieved 1 February 2014. ^ "Joe Hart wins Premier League Golden Glove award". Manchester Evening News. 14 May 2012. Retrieved 2 February 2014. ^ "Stats Zone Premier League Goalkeeper of the Year". FourFourTwo. Haymarket Media Group. 31 May 2013. Retrieved 2 February 2014. ^ a b "Suarez and Pulis claim Barclays season awards". Premier League. 13 May 2014. Retrieved 13 May 2014. ^ Critchley, Mark (18 May 2016). "Petr Cech: Arsenal goalkeeper wins Premier League Golden Glove award ahead of David De Gea". The Independent. Retrieved 24 January 2017. ^ Twomey, Liam (21 May 2017). "Chelsea's Thibaut Courtois wins Premier League Golden Glove award". ESPN. ESPN Internet Ventures. Retrieved 22 May 2017. ^ "De Gea reflects on wining first Golden Glove award". ESPN. ESPN Internet Ventures. This page was last edited on 11 March 2019, at 00:06 (UTC).